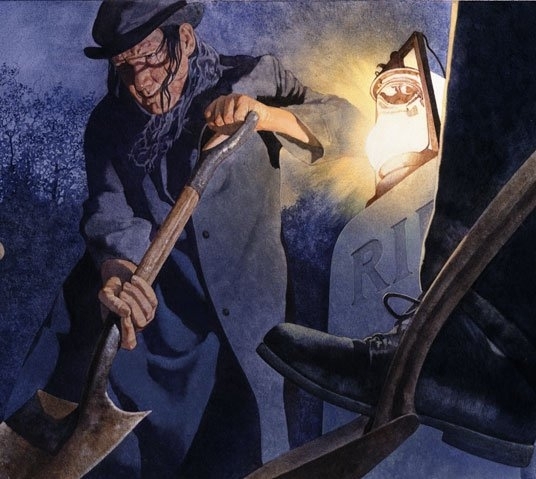 Grave Robbery Under Color Of Law! LAS VEGAS - Talk about the pot calling the kettle black, private guardian Jared E. Shafer's attractive protégé' Patience Bristol is sitting in a cell at the Clark County Detention Center awaiting trial while her mentor may be breathing a sigh of relief allegedly knowing his cooperation with authorities may exonerate him from being prosecuted for many of the same crimes Bristol is accused of committing against the elderly or vulnerable. 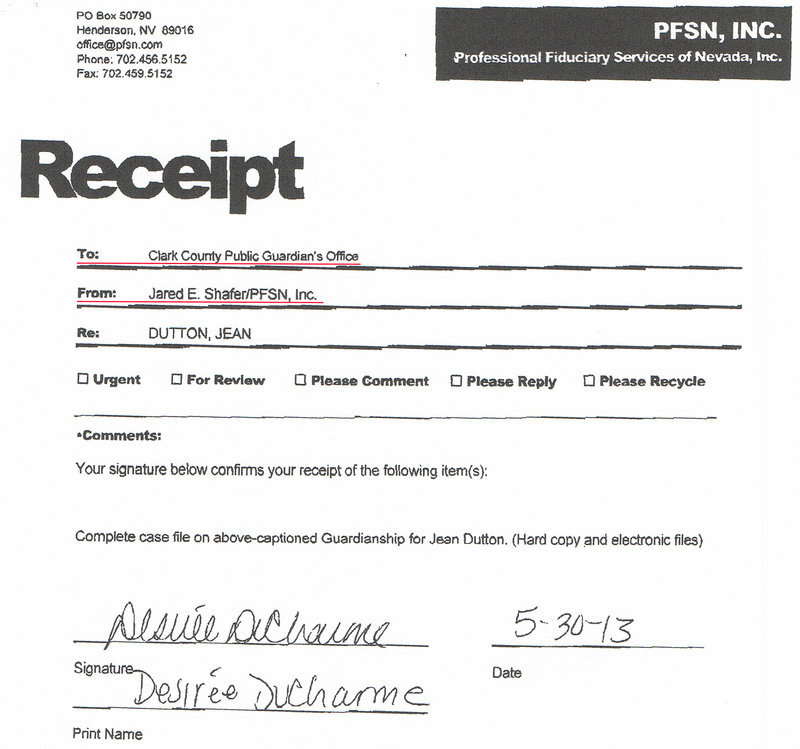 Examples of checks cashed by Bristol for ward's "clothes," "outings," and "personal needs"
Bristol cashed eighteen bogus checks drawn in the name of ward Jean Dutton from Shafer's PFSN, Inc. checking account between September 4 and December 28, 2012 totaling $12,850.00. 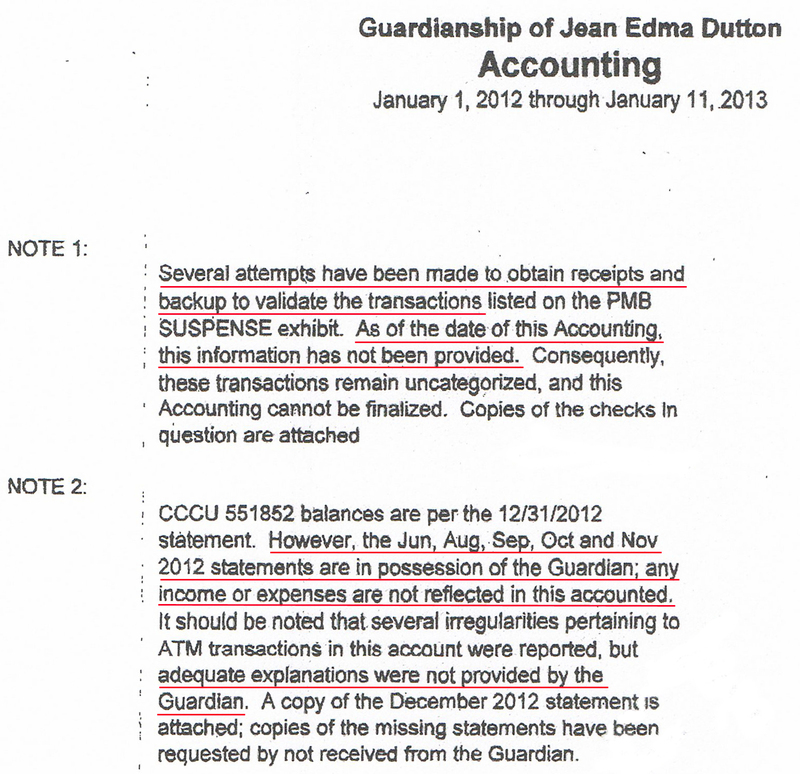 If Shafer truly knew nothing about these transactions, he is also in need of a guardian! As Dutton's co-fiduciary, Shafer is as responsible as Bristol for protecting a ward's assets. Patience Bristol is in custody charged with twenty felony counts of bilking the elderly and vulnerable. Her Preliminary Hearing is scheduled for November 25. Jared Shafer has not (yet) been charged with a crime. "We have one really rich ward whose been dead for over five years." - Patience Bristol, PFSN, Inc.
Leann Goorjian lived to be only 51. She was the daughter of Wanda Lamb Peccole and William "Bill" Peccole. Leann's mother was the sister of former Nevada State Senator Floyd Lamb, Clark County Commissioner Darwin Lamb (portrayed in the movie Casino), and legendary former Clark County Sheriff Ralph Lamb. Leann married Greg Goorgian and together had two sons, Gavin and Camden, now in their late twenties and working for the family business Peccole Nevada Corporation. Three years before Leann died on February 24, 2008 leaving a multi-million dollar fortune, she was placed into the guardianship of Jared E. Shafer. That was in 2005 when she was deemed a "vulnerable person." Since her death, Shafer has not been required to relinquish guardianship over her estate, and continues to this date draining it of hundreds of thousands of dollars each year. Even though Leann has two adult sons who are her natural heirs, Shafer also took possession of her million dollar home at 9409 Queen Charlotte Drive in Henderson. 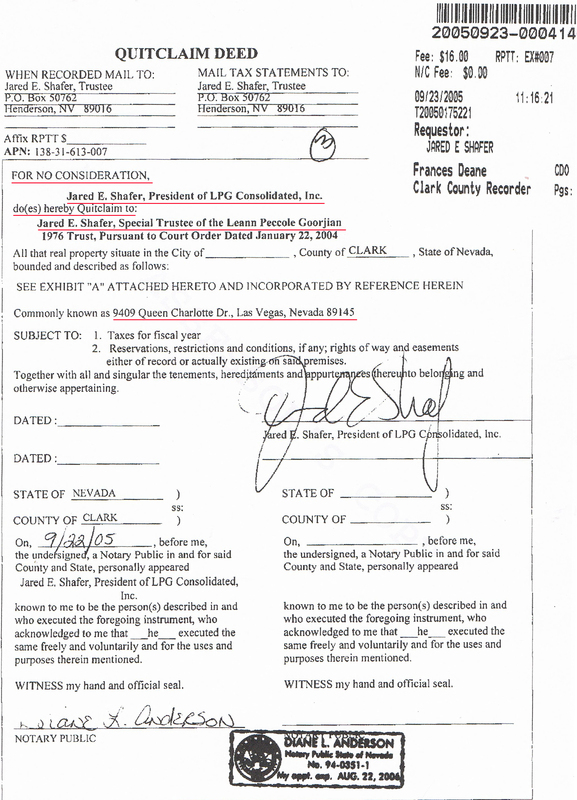 Below is one "Custom Transaction Detail Report" out of fifty-six obtained by INSIDE VEGAS that detail deposits and expenditures Shafer made between 2009 and 2013 on behalf of the deceased woman. The reports include a total of $432,043.00 Shafer paid to himself in "fees" starting with his first self-payment of $294,543.00 on August 4, 2009, eighteen months after Leann passed away, and ending with two payments of $12,500.00 each, one on March 28, 2013, and another on April 19, 2013, again for "fees." This does not include tens of thousands of dollars Shafer paid over the five year period to his personal attorneys, accountants, business partners, and other cronies for their "services" to the deceased woman. 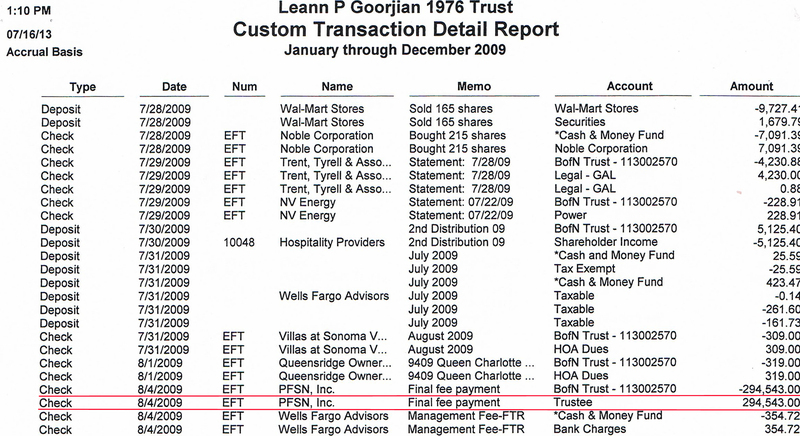 Shafer continued writing checks on Leann's account through July 16, 2013 including an additional $137,500.00 to himself for additional "fees." I have the hardcopy, and have offered to share it with authorities or Leann's family members. RESPONSIBILITIES OF THE GUARDIAN OF THE ESTATE: As guardian of the estate, you will manage and use your ward's property primarily for his or her benefit. Your secondary consideration will be the benefit of your ward's legal dependents (such as a spouse or minor children). THE GUARDIAN OF THE ESTATE SHALL PROVIDE COMPETENT MANAGEMENT OF THE PROPERTY AND INCOME OF THE ESTATE. IN THE DISCHARGE OF THIS DUTY, THE GUARDIAN SHALL EXERCISE INTELLIGENCE, PRUDENCE AND DILIGENCE AND AVOID ANY SELF-INTEREST. Rule 5.5 - There shall be no self-interest in the management of the estate by the guardian; the guardian shall exercise caution to avoid even the appearance of self-interest. (d) Upon approval of the court, for more than 180 days or 90 days, as applicable, if the guardian is awaiting certification from the appropriate authority acknowledging that the guardian has no further liability for taxes on the estate. 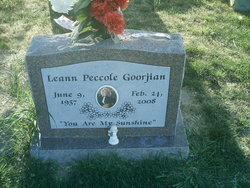 Leann Goorjian died in 2008. According to Nevada Revised Statute 159.193, Shafer had "not more than 180 days" to wind up her affairs. What Clark County Family Court Judge is allowing him to continue Leann's "guardianship" postmortem for over five years - or longer if not stopped? Most likely Guardianship Commissioner Jon Norheim or Judge William O. Voy. Both jurists have been observed doing favors for Shafer in the past. How else could this travesty be allowed to drag on for so long in direct violation of Nevada law? And why haven't Leann's heirs demanded a termination of the exploitation? When I first learned of this unending "guardianship," I contacted a member of the Peccole family. She said that Leann and Greg's sons were told that Shafer is an attorney and that he has their best interests at heart. Shafer is not an attorney! The only record I could find regarding his educational background is that he's a 1961 graduate of Las Vegas High School. Unfortunately, the story of Leann Goorjian is not the first time Shafer, et. al. have manipulated money from elderly or vulnerable people. On February 8, 2008, the SEC filed a civil action against him and others for having "fraudulently offered and sold approximately $180 million in unregistered notes to more than 800 investors, many of whom were senior citizens." Shafer and others were accused of operating a Ponzi Scheme "in which investor funds were used, among other things, to pay promised returns to earlier investors and for family living expenses." Had he not returned the money to his wards, he probably would have been prosecuted and convicted. 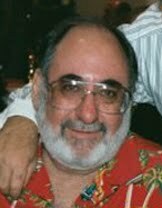 Fifty years ago, I was the afternoon DJ at a radio station located in the window of the Bank of Nevada on Water Street in Henderson. Next to the station was the small office of Peccole Insurance Agency. Each day when Bill Peccole visited the bank, he would wave at me through the window. Everyone in Henderson liked and respected Bill. Not known at the time was that for decades Bill used his savings to buy thousands of acres of raw land in the Las Vegas valley for a few hundred dollars per acre, the basis of his family's present wealth and the inheritance he bequest his daughter Leann. Having known and respected Bill and members of the Lamb family, I feel obligated to try to put an end to a robbery of a portion of this pioneer family's hard earned wealth. I first attempted to inform the Goorjian family of the documented information I have in my possession. That was several weeks ago, and I'm still awaiting their call. In the meantime, I contacted Greg Goorjian's attorney Gus Flangas, and he forwarded my concerns to his client along with the question, "Why is Jared Shafer still controlling Leann's estate?" I also posed this question to the two detectives with the Las Vegas Metropolitan Police Organized Crime and Intelligence Unit who investigated Patience Bristol. I don't expect them to tell me whether they have included Shafer in their investigation, or possibly given him a pass for allegedly ratting on Bristol. There's something missing in this story, and I do not wish to embarrass a wonderful family, but unless Leann's sons are oblivious to this obvious grave robbery under color of law, or there's an arrangement I'm not aware of, Gavin and Camden Goorjian need to claim what is rightfully theirs and put an end to Shafer's unending "guardianship" of their late mother. If they don't need the money, they can donate it to charity, or a non-profit such as the National Association to Stop Guardian Abuse, instead of to Shafer, et. al. In my opinion, for a prominent family and local authorities to sit back and do nothing and allow a "guardian" to steal $432,043.00 in "fees," encourages future exploitation of elderly and vulnerable people in Clark County. The sons of the late Leann Goorjain have the moral responsibility to take immediate action.